The Cuisinart CMW 200 is a good microwave toaster oven combo option for most folks. It has an excellent range of functionality and is affordably priced. The dark tinted glass and brushed stainless steel exterior makes this is a good looking machine. The interior is also stainless steel which is a nice feature because it is easy to sanitize and does not absorb any odors. The Cuisinart CMW 200 has 9 preset options: beverage, fresh vegetable, cake, potato, popcorn, frozen vegetable, roast chicken and pizza. In addition, it has a really neat multi-stage cooking option, an advanced technology which automatically shifts from one function to another. For example, you can defrost a casserole for 10 minutes, bake in the microwave at 100% power for 5 minutes then grill for 1 minute to melt the cheese to top-brown the casserole. The Cuisinart CMW 200 includes a rotating 12 inch glass tray, reversible grill rack, recipe book and a limited 3-year warranty. It has a 1.2 cubic foot (32 litres) capacity and measures 21.20 inches (length) by 19.00 inches (width) by 12.2 inches (height). If you are installing this in a cabinet you should ensure there is at least 6 inches clearance at the back to allow sufficient ventilation to prevent the unit overheating. Overall, the Cuisinart CMW 200 performed well during testing, although we felt that the 1,000 watt power output was a little lacking at times. The two most impressive (and useful!) settings for us were the defrost functions and convection baking. The defrost function is very simple, you can choose to defrost food by weight or by time. The convection baking option ensures food is cooked evenly and in a faster time, with no burned edges or frozen centres. 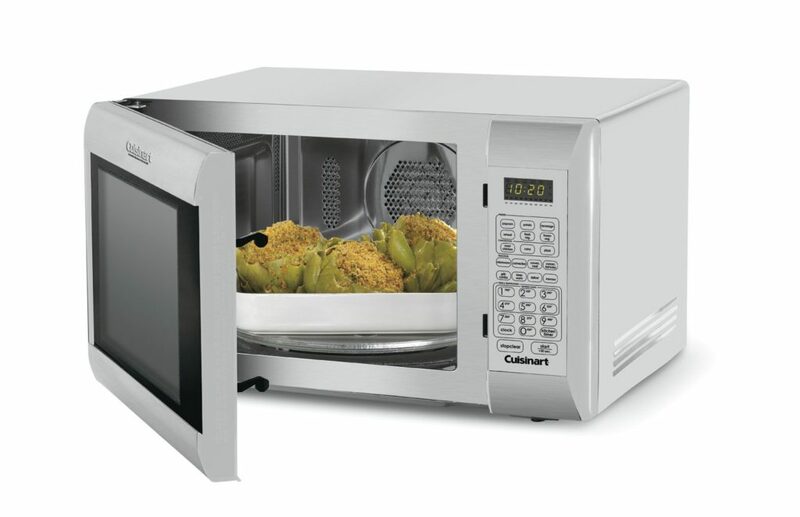 The Cuisinart CMW 200 can bake or roast with or without the microwave function. If you are looking for a microwave toaster oven combo then the Cuisinart CMW 200 is a good choice. It features a stylish design, good functionality and for $180 is good value for money given all the things you can do with it. >> Get more details on the Cuisinart CMW 200 here. The Bella toaster oven is a great performer, albeit a lesser known brand than some of the other choices reviewed here. It has 5 preset settings and simple dials which make it very easy to use. The Bella toaster oven has a 12 liter capacity and measures 15.55 by 10.83 by 8.23 inches. The simple dials and stylish brushed metal design make this an attractive toaster oven and one you would be happy to place on display in your kitchen. It has five preset functions (bake, toast, broil, bagel and warm) which are very user-friendly as you simply select the appropriate setting for the type of cooking required. It also has a toast shade selector to guarantee you perfectly cooked toast every time. With a 1,200 watt power output, and quartz heating technology, the Bella toaster oven cooked evenly and quickly when we put it through a range of tests including chicken, toast, salmon, bagels and a 9 inch pizza. There is also an external crumb tray which we really liked as it makes keeping the Bella toaster oven clean an absolute breeze. As with most toaster ovens, the exterior does get pretty hot when cooking so you will need to ensure that there is sufficient space around the top and back of the toaster oven. 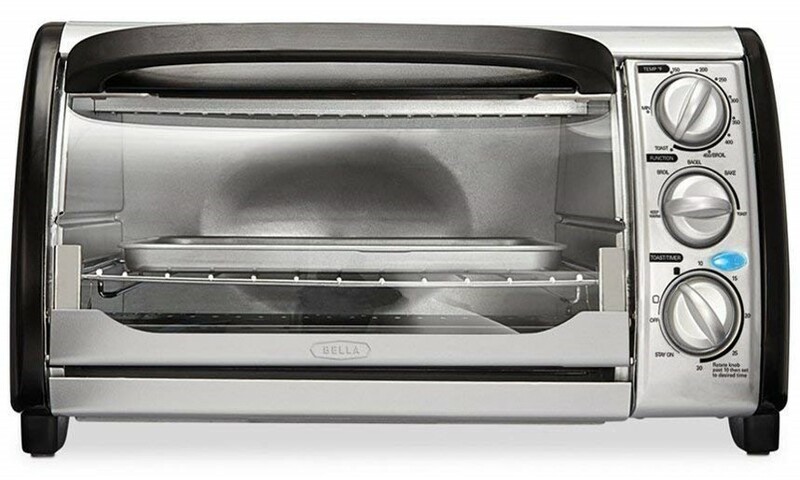 Overall, we were impressed with the Bella toaster oven review because it’s easy to use, toasts well in all five of the preset settings and the removable crumb tray makes cleaning a breeze. Black and Decker kitchen appliances are known for being relatively cheaper than other brands for a product with similar features. The Black and Decker 6-slice digital convection toaster oven is no exception. The Black & Decker toaster oven (6-slice) has preset cooking functions for pizzas, frozen snacks, potatoes, baking and broiling – all of which can be selected with the touch of a button. It also has options to manually alter the temperature and/or cooking time which I really like because it gives you the option to override the preset options in case they are not exactly what you want. 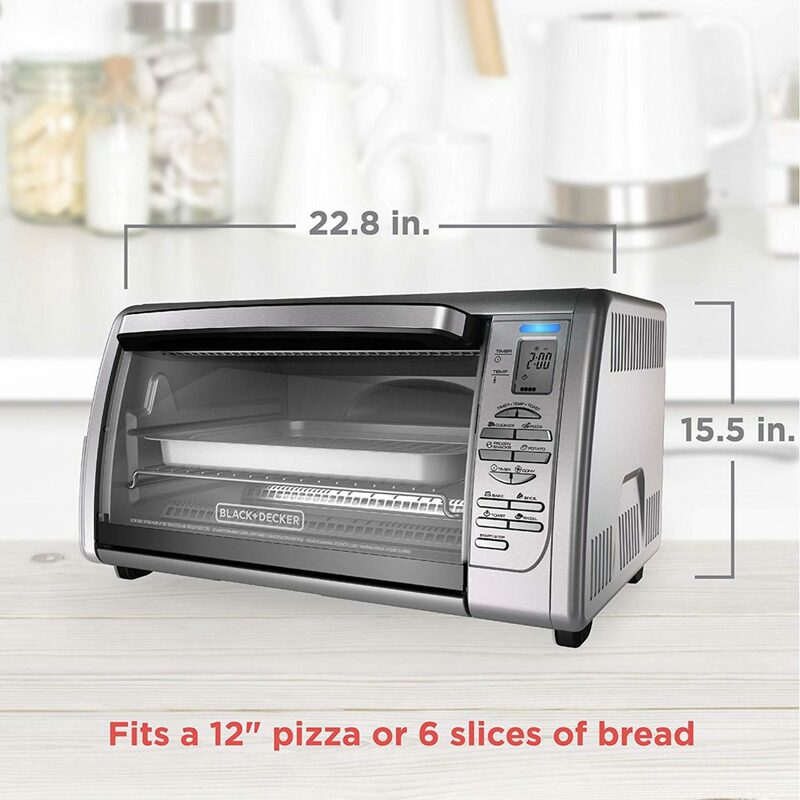 There are 2 positions in the toaster oven to place the wire rack and the oven is large enough to fit a 12″ pizza, 6 slices of bread or even a small truckey or chicken! Once cooking is complete you simply pull out the removable crumb tray which can be cleaned with warm, soapy water. With it’s deep interior and 8 one-touch functions it performed very well when we tested a variety of foods. Convection Baking Mode – Hot air is circulated throughout the oven for fast, even baking. While ultimately we prefer the Oster this does come in at a cheaper price point which may be important to you depending on your budget. The Oster 6-slice is an outstanding toaster oven and a cinch to use! With it’s large capacity you can cook entire meals in this thing, I have even used mine to cook small chickens and a rack of scrumptious baby back ribs. With it’s LCD display and touch panel, preset cooking functions and convection technology the performance of the Oster toaster oven is better than any other oven I have tested. It also scores 4.4 (out of 5) stars based on over 2,500 Amazon customer reviews! The Oster toaster oven design includes an LCD display screen and touchpad which you can use to select the cooking presets, adjust the timer and input temperature settings. I really like this design because it takes the uncertainty out of how much time is left or what the temperature is. Seven preset cooking functions including bake, broil, warm, convection bake, defrost (a useful feature not found on many toaster ovens) and preset toast/pizza buttons. Another feature I liked on this toaster oven is the automatic shut-off which turns off the oven once the timer countdown reaches zero. This is an important safety feature to ensure the toaster oven is not left on indefinetely if you forget to switch it off (and let’s face it we’ve all been there on a Friday night heating some food after a night out lol). The Oster toaster oven performed exceptionally well in all three of its basic cooking functions: broil, bake and defrost. The bake and broil setting allows you to cook foods at high temperatures up to a maximum of 450 degrees. One thing I really like about this oven is it heats up to the preset temperature in a short time (typically around four minutes) so you don’t have to wait long before you can start cooking. To ensure food is cooked evenly, quickly and without any burned edges or frozen centres there is a “convection bake” option which uses a convection fan for more even heat distribution. Additionally, the fact that it includes a defrost option is really handy and you can use it to thaw your food. My final comment on performance is the added bonus that even with all these cooking functions and a high temperature range, the Oster toaster oven is one of the most energy-efficient toaster ovens on the market and uses only 1,300 watts of power while in use. In case you haven’t already guessed, I am a huge fan of the Oster toaster oven and honestly I would feel lost in my kitchen without it. The large capacity, great performance and functional design make this a great addition to your kitchen. At the time of writing, it is selling for under $80 which is an absolute bargain considering its outstanding performance, safety features, and 6-slice capacity. For these reasons the Oster toaster oven has been selected as the “Editor’s Choice” toaster oven. 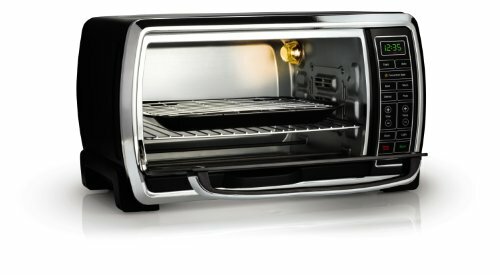 The Hamilton Beach toaster oven has a unique curved door design which opens upwards instead of downwards as all other toaster ovens do. The advantage of this “bread box” toaster oven design is that it allows you safe and easy access to your food meaning you can easily check the food while cooking or add seasoning to your meal. What I really like about the Hamilton Beach toaster oven is it’s simple, easy-to-use dials. Instead of having lots of confusing control panel options (which I know some people prefer) there are just two simple dials one of which controls the temperature and the other the timer. When cooking with the Hamilton toaster oven it performs well with fast, even cooking due to the convection fan as well as the top and bottom heating elements. The 4-slice capacity is less than the Oster toaster oven which is something to think about when deciding if this is the right choice for you. 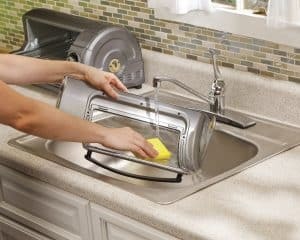 Once you are done cooking it’s so easy to clean up, you can simply remove the crumb tray give it a quick wipe to remove any crumbs then detach the door and wash in warm soapy water.. Overall the Hamilton Beach toaster oven is an excellent choice if you are in the market for a 4-slice sized oven. 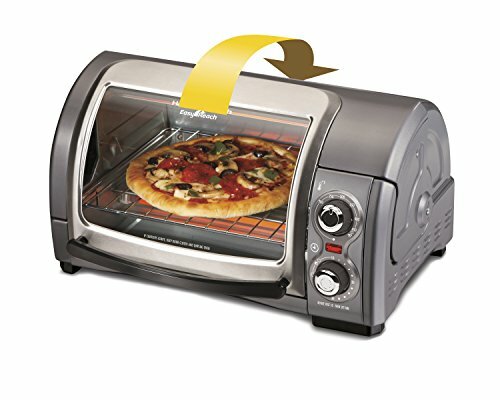 The curved, upwards opening door is unique to Hamilton and makes an enormous difference when you are cooking and handling food in the toaster oven. I like the simplicity of the 2-dial control system because it makes the Hamilton Beach toaster oven really simple and easy to use. Toaster Ovens Online is dedicated to bringing you good, honest reviews of toaster ovens. We want to share with you the latest reviews to help you choose a toaster oven that is right for YOU!